David P. Homer was sustained as a General Authority Seventy of The Church of Jesus Christ of Latter-day Saints on March 31, 2018. He had been serving as a member of the Third Quorum of the Seventy at the time of his call and he had previously served as a member of the Sixth Quorum of the Seventy from 2013 to 2014. 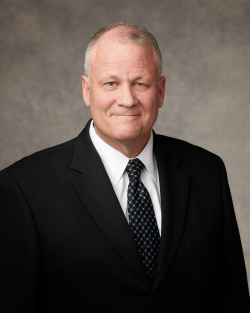 He has served in the Church in various callings, including ward executive secretary, elders quorum president, bishop, stake president, nursery leader, and bulletin board specialist. He has also served as an Area Seventy. Homer holds a master’s degree in business administration from the University of Pennsylvania and earned a bachelor of science degree in economics from the University of Utah. He worked for General Mills for over thirty years, filling assignments in the United States, Latin America, Australasia, Europe, and Canada. When he retired, he was CEO of Cereal Partners Worldwide, a global joint venture between General Mills and Nestlé S.A. He was born on April 25, 1961, in Salt Lake City, Utah. He married Nancy Dransfield in the Salt Lake Temple in 1984 and they have six children. This page was last edited on 30 April 2018, at 18:17.